The London-based Canadian designer is the latest to reimagine Caesarstone surfacing – and his installation is the most playful gesture yet. We caught up with Malouin just days before the debut of Swings at Toronto’s Interior Design Show. 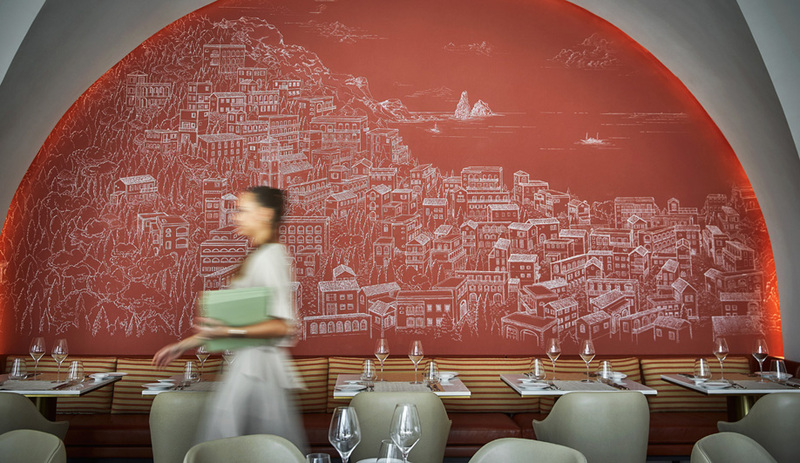 For a few years now, Caesarstone has been wowing design fair crowds with its collaborations. 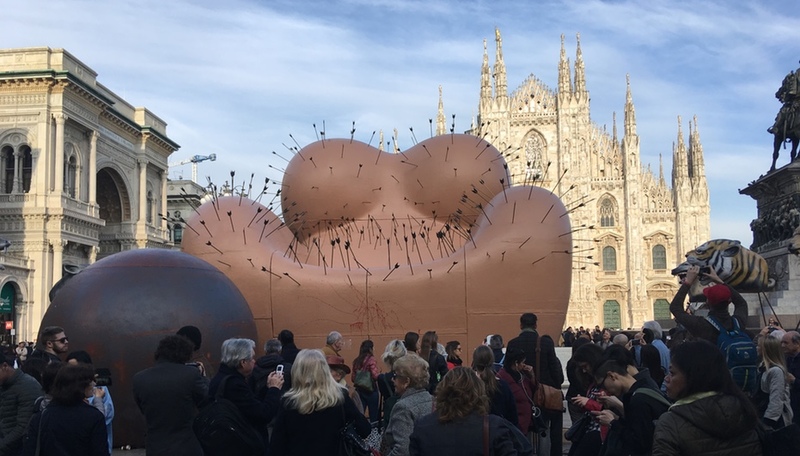 Each year, they make their debut at Toronto’s Interior Design Show – these fantastic concepts that reimagine the company’s manmade stone – then are reinstalled during Milan design week in April. In 2013, the Tel Aviv–based brand worked with Japan’s Nendo on Stone Garden, a light-as-air installation of tables with multiple overlapping tops. And last year, its wonderful Islands by Raw Edges captured everyone’s imagination. 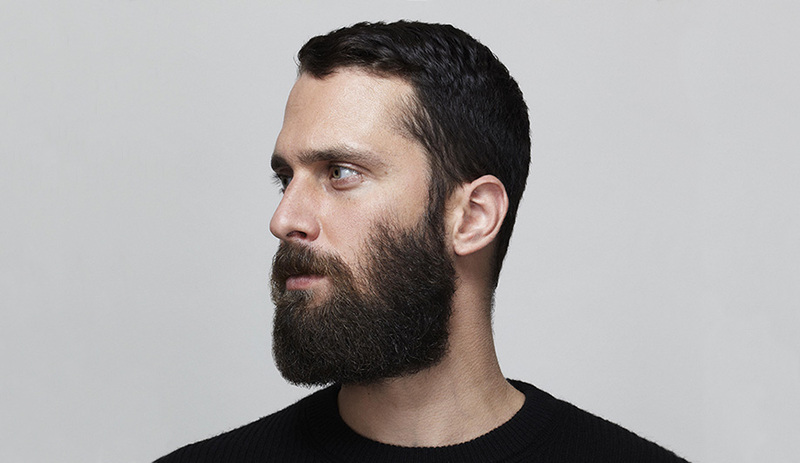 This week at IDS, the brand will debut Swings – a new installation by Philippe Malouin, a designer who specializes in experimental, art-influenced works. The circular, 12-piece swing set turns showing off samples of the quartz material into a playful gesture. We talked with Malouin to find out more about this project, and a few others. 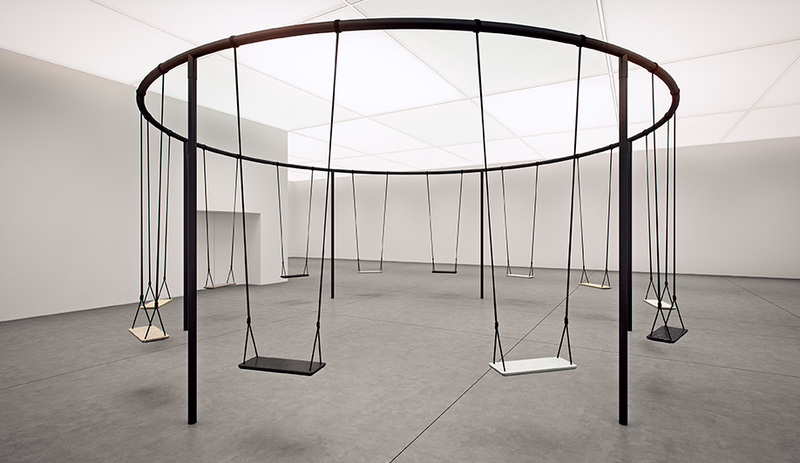 In your collaboration with Caesarstone, how did you come up with the idea of making Swings? We racked our brains for an installation – with the idea of surrealism, we thought of taking the composite stone out of its context and reappropriating it in a gallery context. 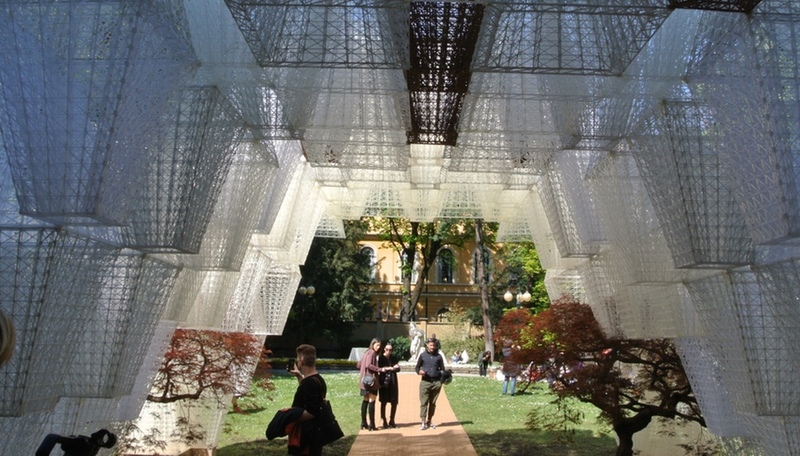 In that sense, something like Swings could be seen as a surreal installation. We still show all of the company’s product samples in a well displayed and orderly fashion, but at the same time involving movement and participation – actually taking the stone out of its context, and making it a playground item. As designers and artists, we like to take extremely simple things and change a few variables to make a design intervention. With this particular project, it worked extremely well. 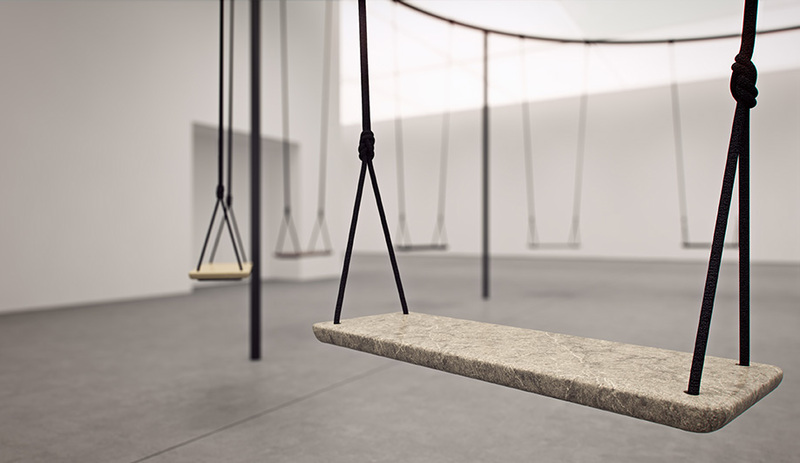 You wouldn’t expect, ever, for Caesarstone to be used as a seat for a swing, so it creates the element of surprise. Swings feels like an art installation. Do you often look to the art world for inspiration? I tend to look at art a lot more than I look at anything else. The interesting thing about art is the only function is its own existence, so it leads to very interesting works of geometry, colour composition, shape and proportion. As a strictly formal piece of inspiration, art is always extremely interesting, especially American minimalist art from the 1960s – in terms of form-generating, it was a very exciting time. As far as other inspiration, it definitely comes from experimentation and trying things out, without having a specific end goal. If you start with a material and experiment on it, your discovery might find, for example, that a certain transparency could be allocated for an interesting light. That’s how I work on most projects: start with a material or a certain process, and then make a discovery and expand on it. Besides manufactured stone, what other materials would you like to try out? I’ve never really worked with 3D printing, and now it is quite interesting because you can print in ceramics, in metal, in plastic. We tend to work with our hands a lot, and we tend to work with materials we have direct access to, and then transform them with the tools in our studio, which is quite well equipped – but to work with something intangible, like current 3D printing techniques, could be quite interesting. What object would you like to create but haven’t made yet? A consumer electronic, like a stereo. I haven’t been approached yet by any brands, so maybe after this interview, someone will talk to us about it. What future projects are you most excited about at the moment? We’re working on a contract chair, a first for us, and it’s exciting because it’s something I’ve desired for so long, and we just needed to find the right partner. We’re also doing new work with some of the companies we’ve worked with in the past, to be revealed this year in Milan and also this May in New York at ICFF – and then, we’re also working on quite a lot of private commissions, which gives us a lot of leeway to experiment and explore. But in terms of commercialized products, we have about two or three coming out this year. We’re doing one project for a manufacturer that is affordable, small and playful – I’m very excited about that!